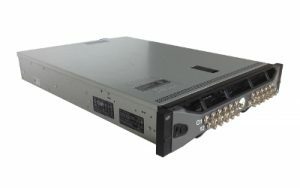 The syn1588® VMS is a multi-channel, high resolution, high accuracy data acquisition system, dedicated to analyze the synchronization performance of nodes using different means of synchronization mechanisms like PTP or NTP. The syn1588® VMS (Visual Measurement System) is designed for observing, comparing and analyzing of 1 PPS signals. Up to 22 channels can be analzed in parallel. The syn1588® VMS uses the well-known syn1588® PCIe NIC as the 1 PPS capture card capable of measuring of up to 22 input channels. The syn1588® 1 PPS capture card handles all inputs simultaneously. Each input is capable of sampling signal transitions at a resolution of 4 ns. The syn1588®VMS is capable of analyzing and displaying the offset between all 1 PPS signals. It continuously updates the mean value, standard deviation, and maximum and minimum value respectively. On a per channel basis it is possible to set alarms triggering events whenever the offset of a channel exceeds a predefined boundary. This allos to use the syn1588® VMS as an online monitoring or analysis tool. There are additional data analysis functions like MTIE, ADEV, and TDEV available as well. In the last three years the syn1588®VMS system has been successfully used 1588 plugfests held at the ISPCS to verify the clock synchronisation accuracy of the IEEE1588 nodes from different vendors.